Way back in 2009, some folks on the left shared a chart showing that national expenditures on healthcare compared to life expectancy. This comparison was not favorable to the United States, which easily spent the most money but didn’t have concomitantly impressive life expectancy. At the very least, people looking at the chart were supposed to conclude that other nations had better healthcare systems. And since the chart circulated while Obamacare was being debated, supporters of that initiative clearly wanted people to believe that the U.S. somehow could get better results at lower cost if the government played a bigger role in the healthcare sector. There were all sorts of reasons to think that chart was misleading (higher average incomes in the United States, more obesity in the United States, different demographics in the United States, etc), but my main gripe was that the chart was being used to advance the cause of bigger government when it actually showed – at least in part – the consequences of government intervention. The real problem, I argued, was third-party payer. Thanks to programs such as Medicare and Medicaid, government already was paying for nearly 50 percent of all heath spending in the United States (indeed, the U.S. has more government spending for health programs than some nations with single-payer systems!). But that’s just party of the story. Thanks to a loophole in the tax code for fringe benefits (a.k.a., the healthcare exclusion), there’s a huge incentive for both employers and employees to provide compensation in the form of very generous health insurance policies. And this means a big chunk of health spending is paid by insurance companies. The combination of these direct and indirect government policies is that consumers pay very little for their healthcare. Or, to be more precise, they may pay a lot in terms of taxes and foregone cash compensation, but their direct out-of-pocket expenditures are relatively modest. And this is why I said the national health spending vs life expectancy chart was far less important than a chart I put together showing the relentless expansion of third-party payer. And the reason this chart is so important is that it helps to explain why healthcare costs are so high and why there’s so much inefficiency in the health sector. So why, then, would anybody think that Obamacare – a program that was designed to expand third-party payer – was going to control costs? Though I guess it doesn’t matter what anybody thought at the time. The sad reality is that Obamacare was enacted. The President famously promised healthcare would be more affordable under his new system, both for consumers and for taxpayers. Well, the law’s clearly been bad news for taxpayers. But let’s focus today on households, which have borne the brunt of the President’s bad policies. The Wall Street Journal had a report a few days ago about what’s been happening to the spending patterns of middle-class households. The numbers are rather grim, at least for those who thought Obamacare would control health costs. 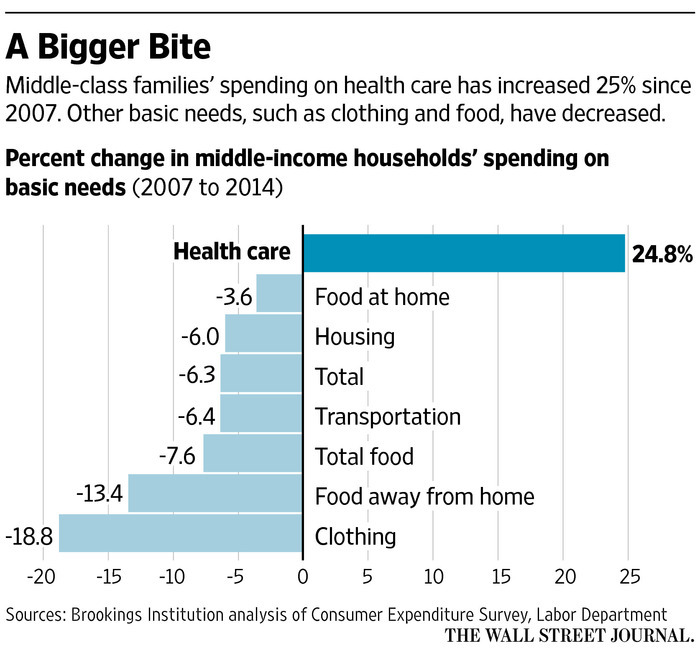 A June Brookings Institution study found middle-income households now devote the largest share of their spending to health care, 8.9%… By 2014, middle-income households’ health-care spending was 25% higher than what they were spending before the recession that began in 2007, even as spending fell for other “basic needs” such as food, housing, clothing and transportation, according to an analysis for The Wall Street Journal by Brookings senior fellow Diane Schanzenbach. …Workers aren’t the only ones feeling the pain of rising health-care costs. Employers still typically pay roughly 80% of individual health-insurance premiums… In 2015, 8% of Americans’ household spending went toward health care, up from 5.8% in 2007, according to the Labor Department. Here’s a chart from the story. It looks at data from 2007-2014, so it surely wouldn’t be fair to say Obamacare caused all the increase. But it would be fair to say that the law hasn’t delivered on the empty promise of lower costs. Let’s close with a few important observations. First, there’s a very strong case to repeal Obamacare, but nobody should be under the illusion that this will solve the myriad problems in the health sector. It would be a good start, but never forget that the third-party payer problem existed before Obamacare. Second, undoing third-party payer will be like putting toothpaste back in a tube. Even though there are some powerful examples of how healthcare costs are constrained when genuine market forces are allowed to operate, consumers will be very worried about shifting to a system where they pay directly for a greater share of their healthcare costs. Third, there’s one part of Obamacare that shouldn’t be repealed. The so-called Cadillac Tax may not be the right way to deal with the distorting impact of the healthcare exclusion, but it’s better than nothing. Actually, we could add one final observation since the Obama era will soon be ending. When historians write about his presidency, will his main legacy be the Obamacare failure? Or will they focus more on the failed stimulus? Or maybe the economic stagnation that was caused by his policies? I agree with David that the only “fair” approach should be individual. If it is moved to the individual, we should have “medical monitors” (for a fee) that direct us to the best/cheapest (those two are in conflict, but should be in the discussion). Medical monitors would flatten what is now the asymmetric relationship between doctor and patient. In addition, we should accommodate pre-existing conditions. Many are covered with legacy programs. For those that are not special programs should be arranged. The rest should be covered cradle to grave. Eventually there will be no pre-existing conditions. We should not make coverage mandatory, but those not covered should bear the consequences. It would be helpful if everyone had a UBI and health coverage form the UBI was placed in a separate Health Savings Account. “Aristocratic” vs “Market-Based” medical care! 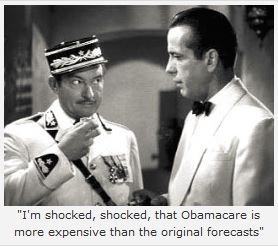 The last time medical care was affordable or market controlled was in the early 1960’s. Why? Because, in the early 60’s and previously, nearly every family or individual paid cash for their medical care. The Nobility’s or government employee’s medical-insurance-coverage’s is the prerogative of status within America’s Aristocratic Society. Every penny of the Nobility’s or government employee’s salaries and benefits are paid for by taxes from private enterprise employers and employees. Not one cent has or will be paid by the government employee for their luxury type of medical insurance coverage’s. The government employee receives 100% of their wages and benefits from the government’s general fund. The government employee’s April 15 paper work submitted as taxes paid is, in reality, just a negotiation over their net take home money’s. Nothing was or has ever been contributed to the general fund by the government employee, be they city, county, state or federal employee. Mysteriously, first class medical insurance coverage’s are economically affordable or available to employee’s of large businesses or corporations (the Vassals). Probably due to scale, size or whose-bread-got-buttered by special deals in Congress (the Nobility), these same loop-holes seemingly are not available to smaller enterprises or individuals (the Subjects). I am quite sure those loop-holes provided to large businesses and corporations and their employees resulted in inflicting extra and unknown burdens upon the less-politically-connected family businesses and smaller scaled private enterprise employers and their employees (the Subjects). The subjects are those citzens who ended-up-getting-screwed trying to achieve the goal of obtaining affordable healthcare? The subjects represents the most important and productive portions of the economic society in the USA? The subjects are those hard working independent individuals, family businesses, small scale entrepreneurs and their employees. Return to “Market-Based-Medical-Care-Precepts” as fathomed in our constitutional system of free markets (capitalism). For instance, no one should be allowed to obtain medical insurance or medical care from a third party, such as an employer, whether that employer be private enterprise or government. Instead, mandate that everyone possess their own private medical-care-savings-account with 5 % (or ?) taken out of their salary, commission, contract or whatever. There should be, absolutely, no mandate that anyone has any particular kind of health insurance coverage, nor regulations on who, what, where or the amount of insurance coverage. Nor, should government mandate a single payer or socialized or nationalized medical care systems upon its citizens. The majority of single folks will, by nature, have no medical insurance coverage. The non-insurance-policy-holder is the singular method or mechanism that could ever re-apply a market force between the provider and patient in order to bargain for the most equitable price. In 2018, the majority of US citizens possess medical insurance coverage, via 3rd party, with the medical provider knowing contents of said coverage which eliminates meaningful negotiations between patient and provider. The provider knowing the amounts of insurance coverage has created a zero market force being applied towards obtaining an equitable price between provider and patient. The medical provider should never be allowed to know the contents of any insurance plan! The bargaining for equitable price should be under the premise that a patient, does not possess, any kind of medical insurance. If the majority of the US citizens DID NOT POSSESS a 3rd party purchased medical insurance policy, in which the current providers possess for-knowledge of coverage, then, market forces could be re-asserted, resulting in an equitable price. Under MARKET BASED PRECEPTS most families with children will have catastrophic or hospitalization insurance coverage. Under, MARKET BASED PRECEPTS practically no one will possess, the now most commonly held, comprehensive-medical-insurance-coverage because this type of coverage does not encourage the application of market forces. The goal would be to re-establish, as it was from this country’s founding until the early 1960’s, equitable market forces re-installed upon the honorable vocation of medical care. When did common sense enter into the Obama administration? Unstable due to the government controlling around sixty percent of expenditures. No free market can operate at such a high level of government intervention. Even half that level would be enough to destabilize any market. So American healthcare is unstable. It cannot possibly live long in this unstable position. Too dominated by government to operate as a free market, yet not regulated and dominated enough to prevent massive rent seeking by special interest groups. As an unstable system American healthcare will either move towards free markets or towards total government control. Unfortunately, the American people have clearly shown in which direction they plan to resolve this instability. P.S. As far as historians recognizing an inflection point in the Obama years don’t hold your breath. Have any historians discovered any inflection points in Europe’s massive adoption of welfare more than fifty years ago? What is the dominant narrative in Europe? It is: “We are failing because we have not subdued enough of our economy to collective control.” Translation: “Our government is not yet big enough to create sufficient growth to match the world average and stave of our continental decline”. Nobody seen the same narrative taking hold on this side of the Atlantic? Really? The most serious flaw resulting from third party payer is the destruction of the price mechanism in healthcare. No one has any idea what the real cost of a procedure should be. Since government and insurance companies receive deep discounts off the stated price for volume purchases, an individual paying his own way would be totally screwed. The system has for so long been dominated by huge healthcare providers being paid by huge third party payers that the elimination of third party payers is close to impossible. When historians write about his presidency, will his main legacy be the Obamacare failure? Or will they focus more on the failed stimulus? Or maybe the economic stagnation that was caused by his policies? Or his success at setting the MIddle East on fire, spawning the creation of ISIS, and stimulating the mass Middle East Migration into Europe?